Up for grabs is the rare. 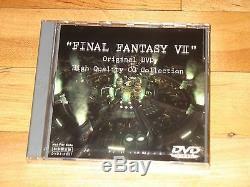 Final Fantasy VII Original DVD High Quality CG Collection. 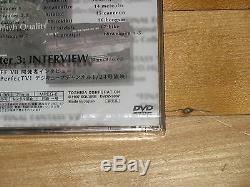 This special disc could only be obtained as a special promo for purchasing a Toshiba Vision Connect computer system in Japan in 1997. Promo items like this are difficult to obtain, making it a collector's item! This disc was included for the early adopters of a Toshiba all-in-one settop unit launched in 1997 called the Vision Connect. It was one of the first settop computers of its kind to have DVD playback capability. 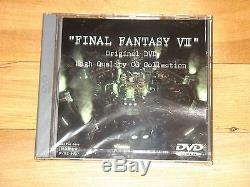 The Final Fantasy VII Original DVD High Quality CG Collection was an incentive bonus for buyers to adopt early. 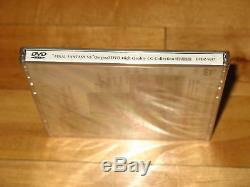 Note that this is a standard Region 2 DVD and can be played back in any multiregion DVD player. In fact, Toshiba still has the original 1997 press release (in English) on their website. I have heard that this DVD was only available to the first 500 purchasers of the Vision Connect, though I cannot find a source to confirm that. 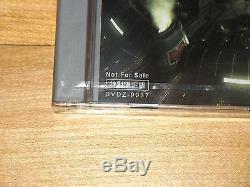 As you can see, this disc was both rare and expensive even upon initial release. What makes this DVD special for Final Fantasy VII fans is that the Square Visual Works department remastered the game's CG to full DVD resolution specifically for this limited disc. As you may know, the original PS1 had a fairly low native resolution, approximately 320 x 224. All movies on this disc have been mastered directly at 720 x 540. I have made multiple comparison shots below to demonstrate the dramatic difference in detail that you can see in the upgraded video. One of the more interesting controversies that have been solved with newly-discovered high resolution footage from the game is the inscription upon Jenova's helmet. It was blurry and unreadable in the original Playstation release. 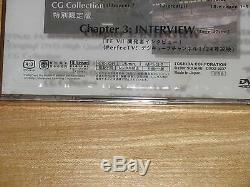 On this disc, the quality is good enough to read: you can read more about this topic on Final Fantasy VII Citadel. Dedicated to this elusive item. As you can see, the disc has the original opening strip around the bottom, and the cellophane wrap has no tears or flaws. No cracks in the case. Below are comparison shots between the low-resolution PS1 video and the High Quality CG Collection. All PS1 images were ripped directly from the original discs using PSmplay. For fans looking for the DEFINITIVE highest-quality archive of the game's CG, this is the disc you want. Why is archiving and preservation of game assets so important? Because game companies often do a poor and incomplete job of archiving their own assets, especially after years of major changes. In recent times, Capcom admitted that they had lost the hard drives containing many of the assets that were used to create the original release of Okami. And so high-quality official captures such as this one may, in some cases, be the best surviving examples of artwork related to a game's production. Also included on this DVD as a bonus feature is a "making of" TV feature that originally aired on PerfectTV! Parts of this feature were later re-edited and released in the US as the Squaresoft Collector's Video VHS, though the DVD contains more interview clips (in Japanese) that were not included on the American VHS. Powered by SixBit's eCommerce Solution. The item "Final Fantasy VII Original DVD High Quality CG Collection 1997 Toshiba promo" is in sale since Wednesday, May 25, 2016. This item is in the category "Video Games & Consoles\Video Game Merchandise". The seller is "retro*dream" and is located in Cumberland, Maryland.